With geographical redundancy, you can rely on a Barman instance that is located in a different data centre/availability zone to synchronise the entire content of the source Barman server. There’s more: given that geo-redundancy can be configured in Barman not only at global level, but also at server level, you can create hybrid installations of Barman where some servers are directly connected to the local PostgreSQL servers, and others are backing up subsets of different Barman installations (cross-site backup). 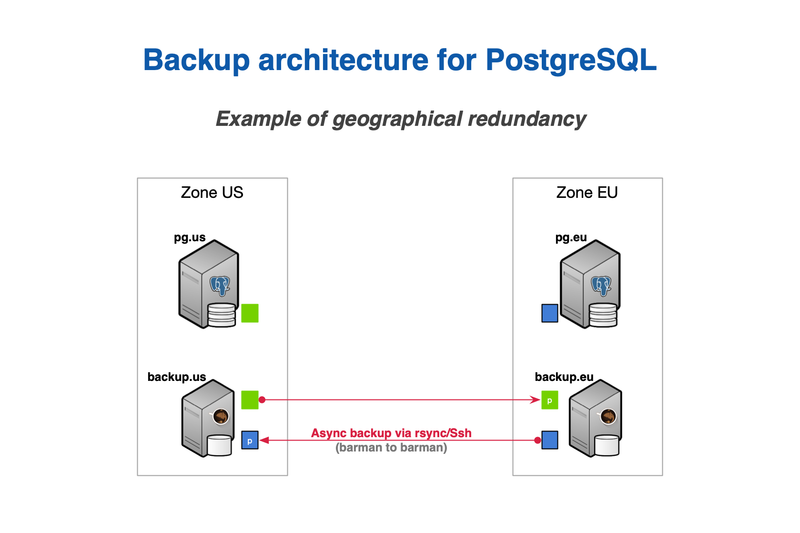 Figure below shows two availability zones (one in Europe and one in the US), each with a primary PostgreSQL server that is backed up in a local Barman installation, and relayed on the other Barman server (defined as passive) for multi-tier backup via rsync/SSH. Further information on geo-redundancy is available in the specific section. Thanks to hook scripts instead, backups of Barman can be exported on different media, such as tape via tar, or locations, like an S3 bucket in the Amazon cloud. Traditionally, Barman has supported standard WAL file shipping through PostgreSQL’s archive_command (usually via rsync/SSH, now via barman-wal-archive from the barman-cli package). With this method, WAL files are archived only when PostgreSQL switches to a new WAL file. To keep it simple, this normally happens every 16MB worth of data changes. Barman 1.6.0 introduces streaming of WAL files for PostgreSQL servers 9.2 or higher, as an additional method for transactional log archiving, through pg_receivewal (also known as pg_receivexlog before PostgreSQL 10). WAL streaming is able to reduce the risk of data loss, bringing RPO down to near zero values. Barman can be installed on RHEL7 and RHEL6 Linux systems using RPM packages. It is required to install the Extra Packages Enterprise Linux (EPEL) repository and the PostgreSQL Global Development Group RPM repository beforehand. Official RPM packages for Barman are distributed by 2ndQuadrant via Yum through 2ndQuadrant Public RPM repository, by following the instructions you find on that website. By doing this, you solely rely on 2ndQuadrant repositories for package management of Barman software. For historical reasons, 2ndQuadrant keeps maintaining package distribution of Barman through Sourceforge.net. 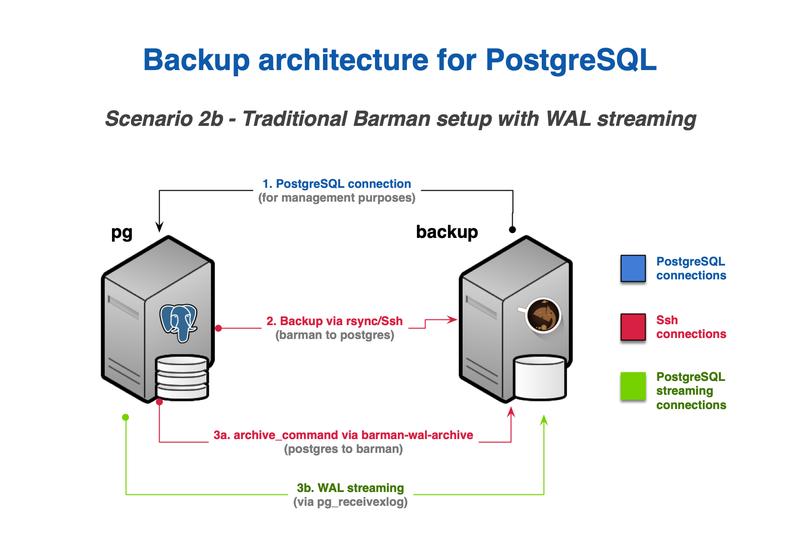 Barman can reduce the Recovery Point Objective (RPO) by allowing users to add continuous WAL streaming from a PostgreSQL server, on top of the standard archive_command strategy. Barman relies on pg_receivewal, a utility that has been available from PostgreSQL 9.2 which exploits the native streaming replication protocol and continuously receives transaction logs from a PostgreSQL server (master or standby). Prior to PostgreSQL 10, pg_receivewal was named pg_receivexlog. IMPORTANT: Barman requires that pg_receivewal is installed on the same server. For PostgreSQL 9.2 servers, you need pg_receivexlog of version 9.2 installed alongside Barman. For PostgreSQL 9.3 and above, it is recommended to install the latest available version of pg_receivewal, as it is back compatible. Otherwise, users can install multiple versions of pg_receivewal/pg_receivexlog on the Barman server and properly point to the specific version for a server, using the path_prefix option in the configuration file. The standard behaviour of pg_receivewal is to write transactional information in a file with .partial suffix after the WAL segment name. Barman expects a partial file to be in the streaming_wals_directory of a server. When completed, pg_receivewal removes the .partial suffix and opens the following one, delivering the file to the archive-wal command of Barman for permanent storage and compression. In case of a sudden and unrecoverable failure of the master PostgreSQL server, the .partial file that has been streamed to Barman contains very important information that the standard archiver (through PostgreSQL’s archive_command) has not been able to deliver to Barman. IMPORTANT: A current limitation of Barman is that the recover command is not yet able to transparently manage .partial files. In such situations, users will need to manually copy the latest partial file from the server’s streaming_wals_directory of their Barman installation to the destination for recovery, making sure that the .partial suffix is removed. Restoring a server using the last partial file, reduces data loss, by bringing down recovery point objective to values around 0, or exactly 0 in case of synchronous replication. From Barman 2.6, the recommended way to safely and reliably archive WAL files to Barman via archive_command is to use the barman-wal-archive command contained in the barman-cli package, distributed via 2ndQuadrant public repositories and available under GNU GPL 3 licence. barman-cli must be installed on each PostgreSQL server that is part of the Barman cluster. Using barman-wal-archive instead of rsync/SSH reduces the risk of data corruption of the shipped WAL file on the Barman server. When using rsync/SSH as archive_command a WAL file, there is no mechanism that guarantees that the content of the file is flushed and fsync-ed to disk on destination. For this reason, we have developed the barman-wal-archive utility that natively communicates with Barman’s put-wal command (introduced in 2.6), which is responsible to receive the file, fsync its content and place it in the proper incoming directory for that server. Therefore, barman-wal-archive reduces the risk of copying a WAL file in the wrong location/directory in Barman, as the only parameter to be used in the archive_command is the server’s ID. For more information on the barman-wal-archive command, type man barman-wal-archive on the PostgreSQL server. Then restart the PostgreSQL server. Where the HOSTNAME placeholder should be replaced with the value returned by hostname --fqdn. This trick is a safeguard in case the server is cloned and avoids receiving WAL files from recovered PostgreSQL instances. The archive-wal command execute maintainance operations on WAL files for a given server. This operations include processing of the WAL files received from the streaming connection or from the archive_command or both. IMPORTANT: The archive-wal command, even if it can be directly invoked, is designed to be started from the cron general command. If the command is run without options, a receive-wal process will be started. This command is based on the pg_receivewal PostgreSQL command. IMPORTANT: This command is automatically invoked by cron and at the end of a backup operation. This means that, under normal circumstances, you should never need to execute it. In case one or more WAL files from the start to the end of the backup have not been archived yet, barman will label the backup as WAITING_FOR_WALS. The cron command will continue to check that missing WAL files are archived, then label the backup as DONE. In case the first required WAL file is missing at the end of the backup, such backup will be marked as FAILED. It is therefore important that you verify that WAL archiving (whether via streaming or archive_command) is properly working before executing a backup operation - especially when backing up from a standby server. IMPORTANT: Do not issue a recover command using a target data directory where a PostgreSQL instance is running. In that case, remember to stop it before issuing the recovery. This applies also to tablespace directories. IMPORTANT: By default, no target action is defined (for back compatibility). The --target-action option requires a Point In Time Recovery target to be specified. For more detailed information on the above settings, please consult the PostgreSQL documentation on recovery target settings. Barman 2.4 also adds the --standby-mode option for the recover command which, if specified, adds standby_mode = on to the generated recovery.conf file, causing the recovered PostgreSQL instance to start as a standby. Further information on standby mode is available in the PostgreSQL documentation on standby server settings. conninfo must point to a database on the destination Postgres database. Using PostgreSQL 9.2, 9.3, 9.4, and 9.5, pgespresso must be correctly installed through CREATE EXTENSION. Using 9.6 or greater, concurrent backups are executed through the Postgres native API (which requires an active connection from the start to the stop of the backup). The destination Postgres server must be the selected streaming replicated standby server. IMPORTANT: When backing up from a standby server, the only way to ship WAL files to Barman that is currently supported is from the master server. This can happen either via traditional WAL archiving with archive_command (as outlined in the “WAL archiving via archive_command” section above)13, or via WAL streaming (with replication slots). NOTE: Currently, ABORT_STOP is ignored by retry ‘post’ hook scripts. In these cases, apart from logging an additional warning, ABORT_STOP will behave like ABORT_CONTINUE. Version 2.4 introduces pre and post backup delete scripts. Version 2.4 introduces pre and post WAL delete scripts. WAL delete scripts use the same environmental variables as WAL archive scripts. Version 2.4 introduces pre and post recovery scripts. It is possible to set up cascading backup architectures with Barman, where the source of a backup server is a Barman installation rather than a PostgreSQL server. This feature allows users to transparently keep geographically distributed copies of PostgreSQL backups. 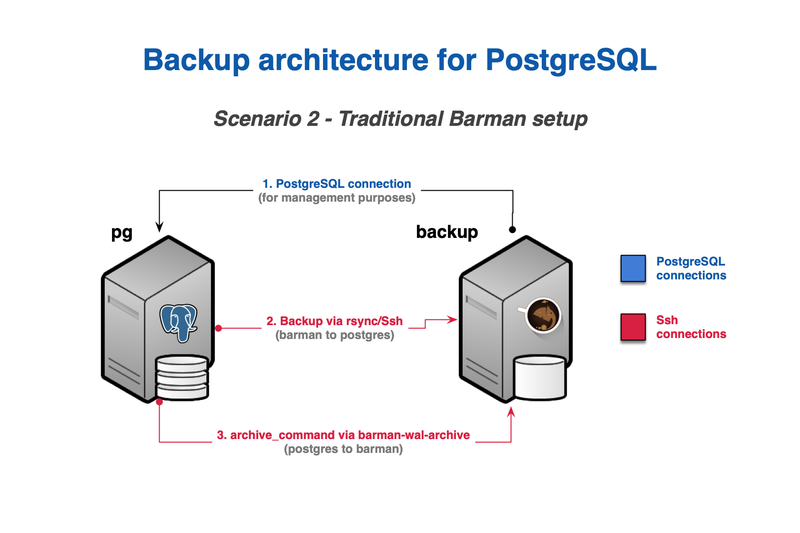 In Barman jargon, a backup server that is connected to a Barman installation rather than a PostgreSQL server is defined passive node. A passive node is configured through the primary_ssh_command option, available both at global (for a full replica of a primary Barman installation) and server level (for mixed scenarios, having both direct and passive servers). The JSON response contains all the required information for the synchronisation between the master and a passive node. If --primary is specified, the command is executed on the defined primary node, rather than locally. This option specifies the SSH connection parameters to the primary server, identifying the source of the backup data for the passive server. Launching sync-backup barman will use the primary_ssh_command to connect to the master server, then if the backup is present on the remote machine, will begin to copy all the files using rsync. Only one single synchronisation process per backup is allowed. It is required by Barman that pg_basebackup and pg_receivewal/pg_receivexlog of the same version of the PostgreSQL server (or higher) are installed on the same server where Barman resides. The only exception is that PostgreSQL 9.2 users are required to install version 9.2 of pg_basebackup and pg_receivexlog alongside with Barman. TIP: We recommend that the last major, stable version of the PostgreSQL clients (e.g. 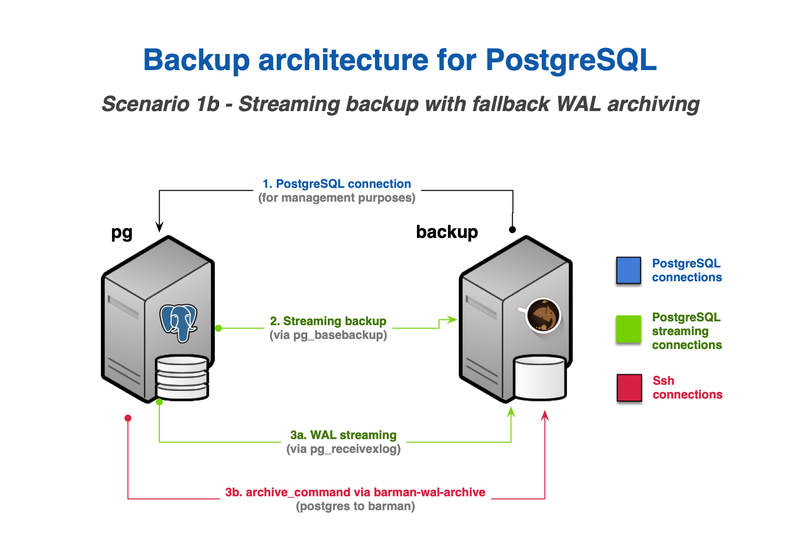 11) is installed on the Barman server if you plan to use backup and WAL archiving over streaming replication through pg_basebackup and pg_receivewal, for PostgreSQL 9.3 or higher servers.